To use the Java Web Start application on this page, you should have a recent Java installed, preferably 32-bit JRE (Java Runtime Environment) 1.8.0_131. 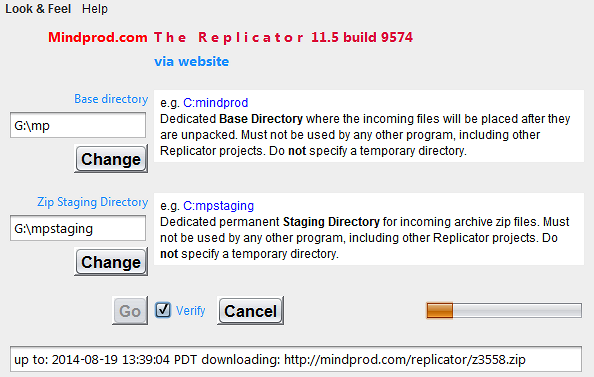 Click the orange launch button to start the Replicator and download the complete mindprod.com website, or update your local downloaded copy. To learn in detail how the Replicator works, read the manual. Java changed the way security works and the Replicator was running afoul of the new rules. I have put in a temporary fix. When I get a Comodo code Signing certificate, I will be able to handle the problem in a strictly kosher way. In the meantime, it should be working again Thanks for your patience. Java has changed the rules for signing of Java Web Start apps. I suspect it wants me to buy a code signing certificate. In the meantime, till I figure out what is going on, The Replicator is down. For this Java Web Start to work, you must click grant/accept/always run on this site/I accept the risk to give it permission to write the downloaded files to your hard disk. If you refuse to grant permission, the program may crash with an inscrutable stack dump on the console complaining about AccessController.checkPermission. This signed Java Web Start application needs 32-bit or 64-bit Java 1.8 or later. For best results use the latest 1.8.0_131 Java. If the above Java Web Start appears to freeze-up, click Alt-Esc repeatedly to check for any buried permission dialog box. Even if JWS (Java Web Start) complains that the certificate used to sign this application is “invalid”, please click grant/accept anyway. on the command line, then click show applications and delete any of the unworking or obsolete applications. Then click show resources and delete any of the unworking or obsolete resources. Then try launching the application again. on the command line, and try launching the application again. If the error message says “program not found” the problem is likely a damaged association between *.jnlp files and the javaws.exe program. To learn how to repair the association, click the Repair button below. For Firefox, select open with: Java(TM) web start launcher. If the above Java Web Start does not work, check the Java console for error messages. If the above Java Web Start does not work, you might have better luck with the downloadable version available below. If you can’t get the above Java Web Start working after trying the advice above and from the red HELP button below, have bugs to report or ideas to improve the program or its documentation, please send me an email at . You can safely abort at any time. The Replicator will pick up where you left off the next time you download. If the Replicator fails, try again in half an hour or so. There may have been a glitch in uploading the files. To read more about how the Replicator works, read the Replicator Manual. The download covers definitions of Java terminology, essays on various Java related topics and pointers to where you can get more information about Java related problems. It also covers the entire mindprod.com website which discusses political, environmental and religious issues. It includes the gay glossary, the Computer Hardware Buyers’ Glossary, all the sound and image files. I update the website many times a day and post the changes to the Replicator. You can stay as up to date as you want. You can run the Replicator to update your local mirror copy as frequently or as infrequently as you like. Whenever you run the Replicator, you will get just the net changes since your last visit. You must run the Replicator every time you want to get the recent updates. It will not automatically schedule itself. After the first time, it will be very quick unless there has been a massive update to all the headers and footers. Google Desktop will then let you find anything in the local mirror with indexes that are only seconds out of date. The Replicator downloads the website is in approximately 1 MB zipped chunks and automatically unpacks and decompresses them. On subsequent visits, The Replicator automatically downloads just new zips containing files that have net changed since your last visit. If the Replicator just sits there and does nothing and you are using version 1.5.0 (build 1.5.0_07-b03). Fedora Core 5 Linux, if you upgrade to Java version 1.6 it will work. If you have trouble, email me at or arrange a phone call and I will talk you through the setup. This software has been working fine for years. It will take a long time (still under 10 minutes for ADSL (Asymmetric Digital Subscriber Line technology) ) for your first download (~85 MB broken into 1 MB pieces) but subsequent ones should be rapid. You can safely abort at any time. The Replicator will automatically pick up where you left off the next time you download. Why download with the Replicator instead of browse online? If mindprod.com goes down temporarily or permanently, you will still have a copy. You can use your local search tools to find things. You are providing yet another level of backup to foil those who would destroy the mindprod.com site. Because the material is constantly changing and won’t stay up to date, please don’t repost pages from my website unless my site disappears completely. The web is littered with out-of-date copies of my material that people stumble on. If you want to host a complete mirror site that I will keep up to the minute, please send me an email at so we can work out the details. With the Replicator, your local copy can now be just as up-to-date at the uncompressed website HTML (Hypertext Markup Language) with very little overhead. See the manual to learn how the Replicator works and how you might use it for your own websites or bulk file distribution problems. To get best performance from the Replicator, you should tweak/tune/configure/adjust your TCP/IP downloading. This will speed up all your Internet connections and downloads, not just the Replicator, perhaps by as much as 100 times. Try any or all of these tuning tools to see which works best for you: TCP Optimizer, TweakMaster and/or QuickDNS. Beware. The Google web accelerator proxy drastically slows down Java Web start unless you configure jawaws.exe to use a direct network connection. Because of a limit inherited from MSDOS and the PKZIP format that the Replicator uses to distribute files, the reconstituted files will have timestamps accurate only to within 2 seconds of the original. The timestamps reflect local time on the source, not UTC (Coordinated Universal Time/Temps Universel Coordonné) time. This will cause no problems with the mindprod.com files since the timestamps are only used to give you an idea of when a file was last changed. To see about getting the Replicator to mirror your own website or distribute your own set of files, click here. for the current version of The Replicator. Efficiently replicates a set of files to your clients and keeps them up-to-date. 2.5MB zip for The Replicator Java source, compiled class files, jar and documentation to run on your own machine as a Java Web Start application. access replicator source in repository with [Tortoise] Subversion client on wush.net/svn/mindprod/com/mindprod/replicator/. download ASP PAD XML program description for the current version of The Replicator. The Replicator is free. Full source included. You may even include the source code, modified or unmodified in free/commercial open source/proprietary programs that you write and distribute. Non-military use only.